Voting opens in the TQF Awards 2018! 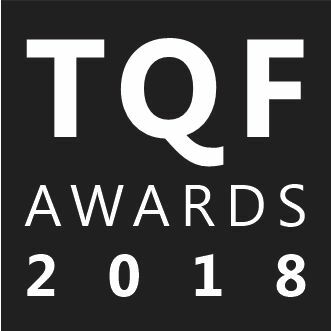 For the next fortnight TQF readers (and non-readers, if they want) can vote in the faintly embarrassing TQF Awards 2018! Click here to vote. Anyone can vote, and you can vote for as many items in each category as you like. The longlist consists of everything we reviewed in issues 58, 59, 60 and 61, in the categories that appeared in the Quarterly Review (audio, books, comics, events, films, music and television), plus categories for best TQF story, cover art and issue. If you aren’t sure what to vote for, click the links provided below to find out more. Voting will continue until midnight, 25 February 2018, with the winners to be announced in TQF62 a few days later. You can rate each item our team reviewed according to how much you'd like it to win, from 1 (not very much) to 5 (a lot). For the items from TQF you can either tick each item to vote for it or not. Last year's award prizes were customised rulers. This year I think they will be tiny toy astronauts. I'm hoping to persuade my daughters to paint little waistcoats on to make them look like our logo. Here's the voting link again. Good luck to everyone! “They say the fair holds one example of all that there is in the world – every food, every spice, every pleasure and every vice,” says nobleman Lahiru, who, though married with three children, will be “hunting the finest boy flesh to be had for many miles” during his visit. Smiler’s Fair is a travelling city, drawn by mammoths from place to place, because no one stays still for too long in this world. Do so and the worm men will get you! The fair, home to scoundrels, scum and psychopaths, takes a daily census of its inhabitants and visitors, and when the first death comes the fair moves on. For our cast of characters, all roads pass through this exciting, squalid, movable feast. The eyes of Krish have silver irises, and so King Nayan, his birth father, wanted him dead to undo a prophecy. Cut from his mother’s belly and stolen away, Krish knows nothing of that, and lives as a shepherd until a brush with the king’s flying squad sets him on the run. Lady Nethmi has been sent by her uncle to marry old Lord Thilak, but he already has a good woman to share his bed. Eric is a teenage sellcock, growing too old for the sleazy customers of his owner, Madam Aeronwen. He decides to follow his favourite client home from the fair. Dae Hyo, perhaps the last of his tribe, would avenge the murder of his people and reclaim his homeland; trouble is, he’s also a recovering alcoholic chased out of town after he fell asleep on the job and got a team of miners killed by the worm men. 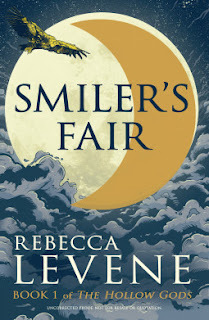 Smiler’s Fair is very much the first part of a series, and doesn’t work brilliantly as a standalone novel. The protagonists move around the board, but few of their stories progress very far. It feels like threads were added till there were enough to fill the pages, rather than because they were truly needed. There’s a common theme to some of them, of scorned and mistreated wives: the woman who adopted Krish, beaten by the husband she always wanted to leave; Nethmi, an unwilling wife with an uncaring husband; Babi, wife of gay lord Lahiru, humiliated by the lover brought into their home. But with no common catalyst, it feels oddly coincidental that these life-changing adventures all begin at once. The prose style feels uncomplicated and perhaps even deliberately simplified: in one five-page section I looked at, ninety-five per cent of the text was made up of one and two-syllable words, with only two of eighteen hundred words reaching five syllables. It feels like the language is pitched at someone with the reading age of eleven or twelve, though the content is far too salty for that age group. This makes it an easy and accessible book to read, but once you notice it’s hard not to feel like the book is talking down to you. Levene’s editorial work on the excellent Doctor Who line from Virgin Books was very well regarded, and this feels rather like a book written by a canny editor who has surveyed the market, thought about what will be marketable (it will appeal to fans of Game of Thrones), and produced a book designed to fit the bill. Some parts are a bit corny – one man becomes the captive of a society of women, who of course require impregnation! – but it’s a solid adventure and I enjoyed reading it. I’m sure it will find fans, though I probably won’t read any sequels: I’m not worried about the characters, nor really intrigued by the trundly setting. The worm men are frightening at first, but the premise of the book, that they can’t dig up into your home if it’s on the move (because the sun poisons the land against them), was unconvincing, and felt like an arbitrary way to set this world in motion. For me that world is in some ways too similar to our own: there are mammoths, but also snakes, cows, horses, goats, rats, etc. Maybe it is our world, or maybe it’s just parallel evolution, but the inclusion of Earth Prime animals in a fantasy novel always feels to me like a wasted opportunity. It’s ironic that fantasy is often less adventurous than science fiction when it comes to these things.